Use that wasted space at your next event with some easy advertising! 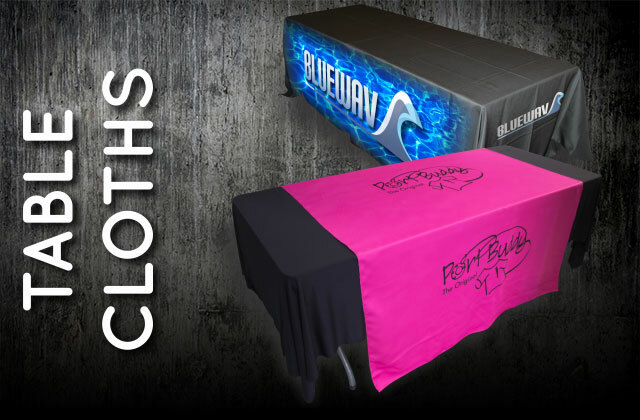 Table cloths are a great way to add some color to your table and booth without taking up any valuable table space. Put your logo, product information and more on a table cloth or runner from S&K Printshop that is sure to turn heads and get you noticed. We offer table cloths for the following table sizes: 4ft, 6ft and 8ft. These should fit most tables with the standard sizing. Our Table Runners are 60 inches wide and can be used on any sized table. Our Table Cloths have only one sewn seam and that is where the back edge of the table top and the back panel meet. All edges are heat sealed to minimize sewing issues. To reduce the weight and bulk of the table cloths our standard design looks like a very wide + sign. Each edge falls over the edge of the table with only a minimial amount of open area on the edges that can have hook/loop style fasteners attached to keep the sides together (most useful in outdoor settings, not normally needed indoors). 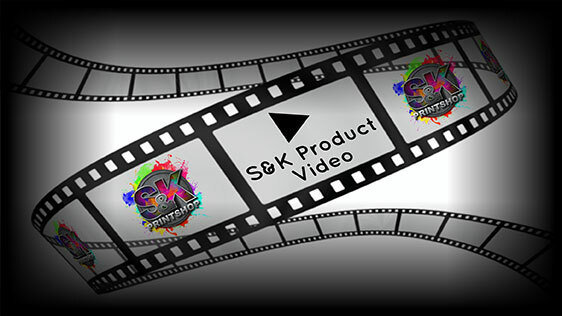 Click Here to get a FREE quote from S&K for next Table Cloth printing job! With our Table Cloths there will be a seam that will fall on the back edge of the table. This sewn edge does not cause any issues with use/function of the Table Cloth. All of our products come with a possible 10% quantity +/- increase/decrease total. These will be mostly seen with larger quantity items such as our stickers/decals, dye sub transfer sheets, mousepads, etc where there are high quantities with the same artwork on each item. The customer will be responsible for any charges for these overages at the same rate per item along with rest of the quoted order. Our Table Cloths/Runners are oversized and will not fit on a standard press. All Table Cloths and Runners must use a rotary press for finishing.